From left:Doc Niimi, Dianne Luke and Rodney Chan. 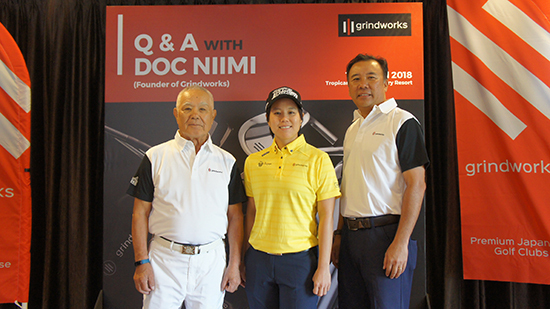 Kuala Lumpur, 14 May 2018: Bespoke Japanese clubmaker grindworks is hoping to expand its business in Southeast Asia following the brand’s immense success in traditional markets like the United States, Japan and Korea. Launched in early 2015 with an initial inventory of high-­‐end wedge heads, the Okinawa-­‐based component specialist now offers the full spectrum of clubs and is available through clubfitters in close to 20 countries. The company’s co-­‐founder and Head of Product Development & Global Sales, Kiyonari Niimi aka ‘Doc Niimi’, noted that their products have enjoyed excellent reception especially in the United States. 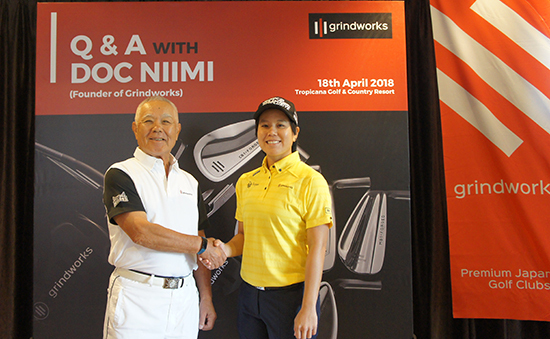 “grindworks is a high-­‐end niche brand catering for golfers who know the game well and who appreciate golf clubs that are manufactured with superb craftsmanship and to the tightest of tolerances,” said Niimi during a product briefing with Southeast Asian dealers at Tropicana Golf & Country Club on April 18. “Compared to other niche Japanese brands, grindworks stands out because our products are not only works of art but are designed for excellent performance as well. We have been getting a lot of orders from clubfitters in the United States as golf consumers there are very knowledgeable and there is an increasing demand for high-­end products that look good and play well,” he added. One of the world’s most respected clubmakers, Niimi has over 40 years of golf industry experience and was admitted to the International Clubmakers Guild Hall of Fame in 2014. In addition to overseeing product development for grindworks, he directs the brand’s global strategy and has been the driving force behind its accelerated growth. 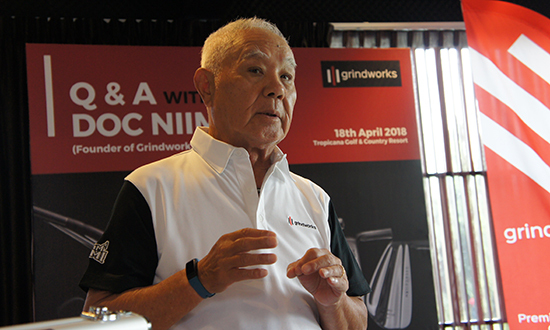 Rodney Chan, the business director of Nippon Golf Tech which is the distributor for grindworks in Malaysia, Indonesia, Singapore and Brunei, noted that they will be holding demo days to enable golfers to try out the new products. “I think the old adage that the ‘proof is in the pudding’ really applies here as you have to try out grindworks clubs to appreciate their superior craftsmanship, performance and feel,” stressed Chan. From left:Doc Niimi with Dianne Luke. Meanwhile, grindworks announced the addition of two Malaysian professionals to its roster of brand ambassadors, namely Dianne Luke and Noel Hassan. 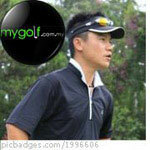 Dianne, who hails from Sarawak, is a touring pro who plays primarily on the China LPGA Tour while Noel is one of the country’s most respected coaches and is currently based at the Kota Damansara Driving Range.